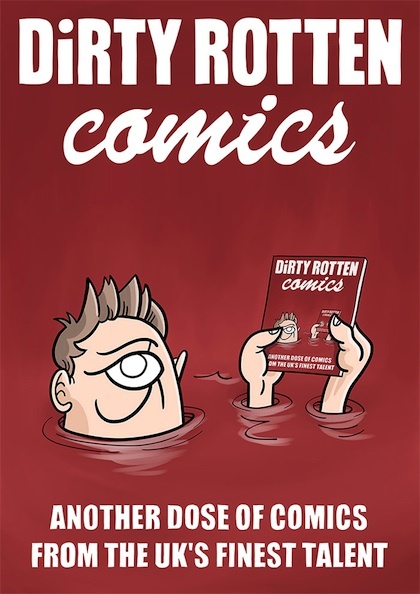 Recently on social media I stated that if I were starting out as a small press comics creator then Dirty Rotten Comics would be my first stop in the anthology world. The reasons for that are twofold. 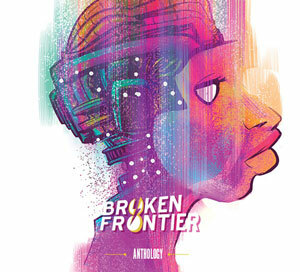 It’s not just the obvious sense of inclusivity of the book – one that I’ve probably noted to the point of tedium every time I’ve mentioned DRC at Broken Frontier – though that in itself led to me describing the anthology as “a laudable exercise and an invaluable platform for the disenfranchised would-be practitioner” when I reviewed its third issue here. Equally importantly, though, there’s also that truly democratic feel to its interiors with obvious newcomers to the form having the chance to sit side-by-side with creators of the calibre of Private Eye cartoonist David Ziggy Greene, established small press voices like Tim Bird and Claude TC, or some of the hottest current talent in the UK small press world like Danny Noble. It’s a wonderful hybrid of slick physical production values with the philosophy of DIY culture, and a reminder that as the accessibility and opportunities for self-publishing continue to grow it’s still absolutely vital that entry point platforms for new creators like Dirty Rotten Comics don’t disappear. Earlier this year I interviewed the DRC editorial team of Gary Clap and Kirk Campbell here about the book as part of this column’s ongoing series of ‘Small Press Spotlight on…’ interviews where they talked about the spirit and ethos of Dirty Rotten Comics. Issue #4 contains around 90 pages of material from 40-something creators ensuring that this is the most comprehensive declaration of Clap and Campbell’s comics-making manifesto to date. It will come as no surprise to regular ‘Small Pressganged’ readers that one of the highlights for me is a longer-form four-page outing for characters Alan and Ollie from Danny Noble’s Was it… Too Much for You? series in ‘Alan and Ollie Get Bored’ (below left). Noble is, of course, one of my ‘Six UK Small Press Creators to Watch in 2015’ and this introduction to her perpetually naked toddlers in adult bodies breaks away from the traditional strip format she normally uses. It’s a wonderfully anarchic , random series of events with a spiralling, wandering narrative that highlights Noble’s chaotic clowning in all its extravagantly self-indulgent glory. 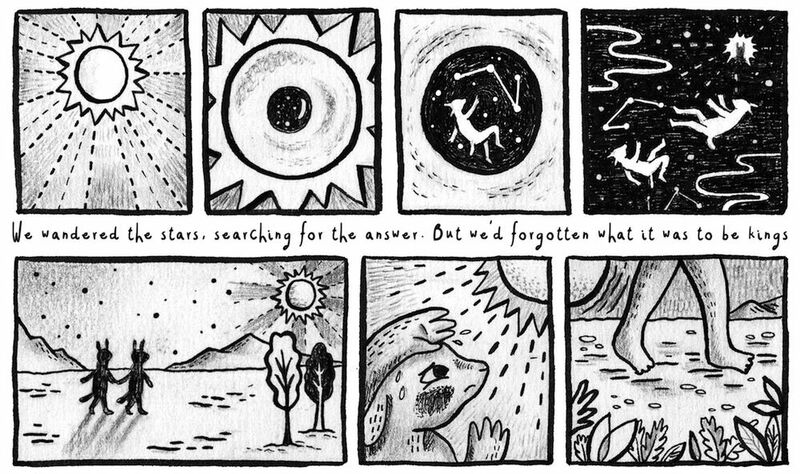 Jey Levang is a creator I discovered for the first time this year and one who will be getting a further spotlight in this column in the not too distant future. Their standout story ‘A Quite Ordinary But Not so Typical Morning’ (below centre) is probably the issue’s most accomplished short. It’s an expectation-confounding tale of teenage demonic life that leads up to a cracking punchline with Levang’s rich cartooning mixing everyday, youthful stroppiness and a dark, occult atmosphere to great effect. 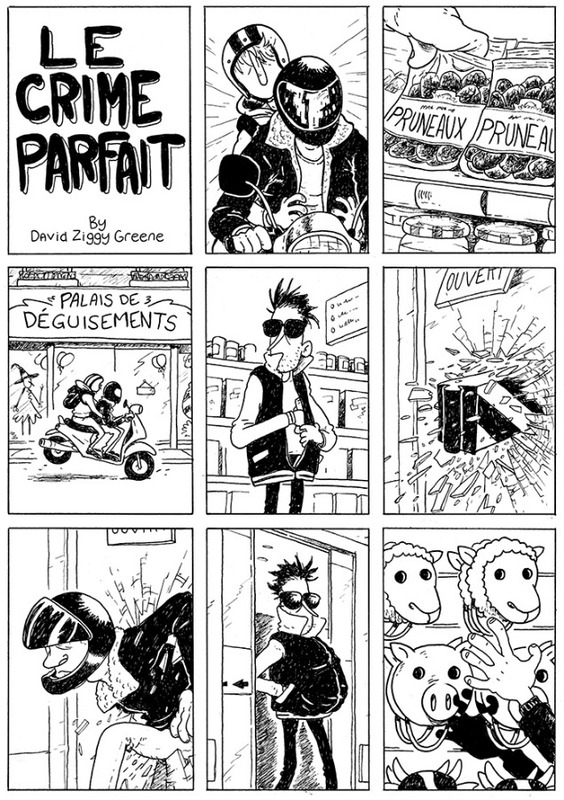 I reviewed David Ziggy Greene’s graphic reportage collection Scene & Heard here at BF last year and it’s fantastic to see a cartoonist of his stature as part of the line-up of #4. 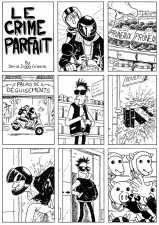 His offering ‘Le Crime Parfait’ (above right) is a fine example of his fluid style and deft comic timing in a suitably scatological criminal plot. 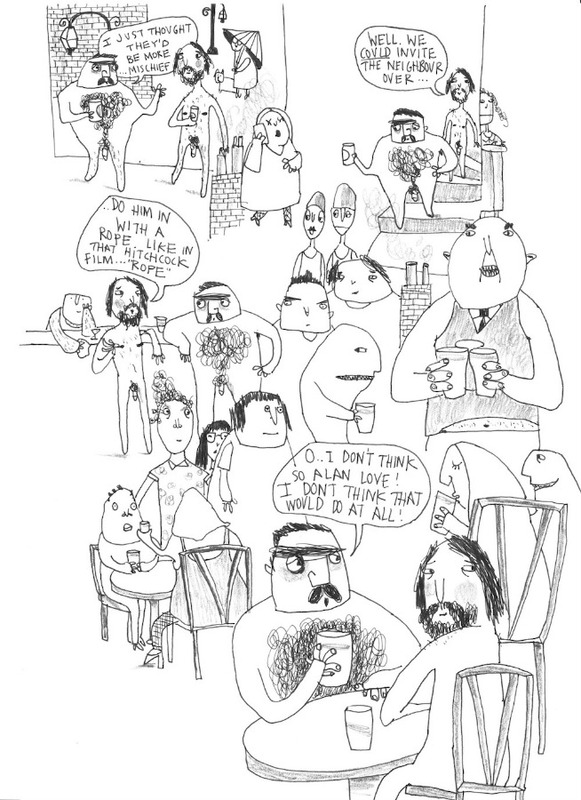 Another ‘Small Pressganged’ favourite, Elizabeth Querstret, contributes another of her endearingly eccentric autobio takes on life in ‘Meeting People’ as she ruminates on the amusingly inappropriate things to fall out of her mouth when greeting folk for the first time. Of the newer names to ‘Small Pressganged’ Emily Rose Lambert’s ‘Dreamscape’ (top banner image) impresses with its mix of the mythological and the recognisable, the otherworldly and the incongruous. 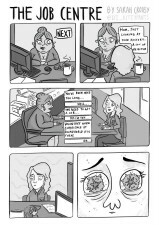 As does Sarah Crosby’s ‘The Job Centre’ (sample page left); a well-paced piece of gory slapstick that has an important piece of social commentary at its heart. 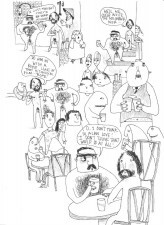 Hannah Lee Miller is an artist whose work I have covered before when I reviewed her graphic medicine minicomic Dementia Dad and, while her entry ‘Turn it Off’ may be treading well-mined ground in its observations on our reliance on personal communication devices, it’s notable for the expressive layouts of its double-pages. 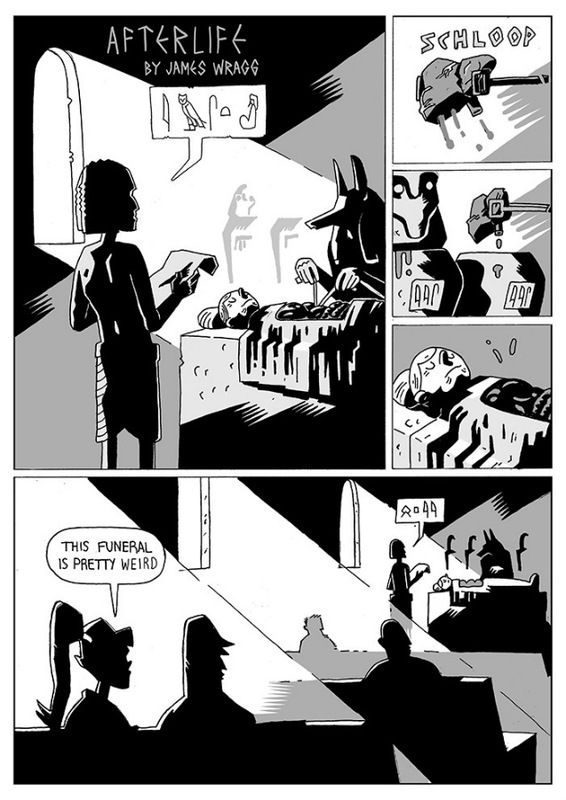 I was also rather taken by James Wragg’s ‘Afterlife’ (sample page below right), a darkly witty reflection on mortality and the futility of life. As with all anthologies I review in ‘Small Pressganged’ I can only ever cover a small proportion of the contributors involved. However with Dirty Rotten Comics #4 I’m barely even scratching the surface. There’s no overarching theme here to this collection beyond its egalitarian attitude but there is a commitment to providing a showcase for creators of all levels to present their work. A number of the artists involved are accomplished creators already while some have a long way to go in honing their craft, and there are others, still, who are clearly just enjoying the opportunity to dabble in comics creation. But that’s what Dirty Rotten Comics is all about – if you have something worth saying in comics form, regardless of technical ability, then they want to hear from you. 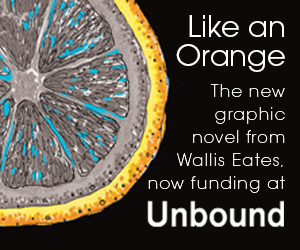 It’s an admirable standpoint and, in its own understated way, it makes DRC one of the most vitally important anthology outlets on the current UK small press circuit. We should never lose sight of the core principles behind Dirty Rotten Comics. 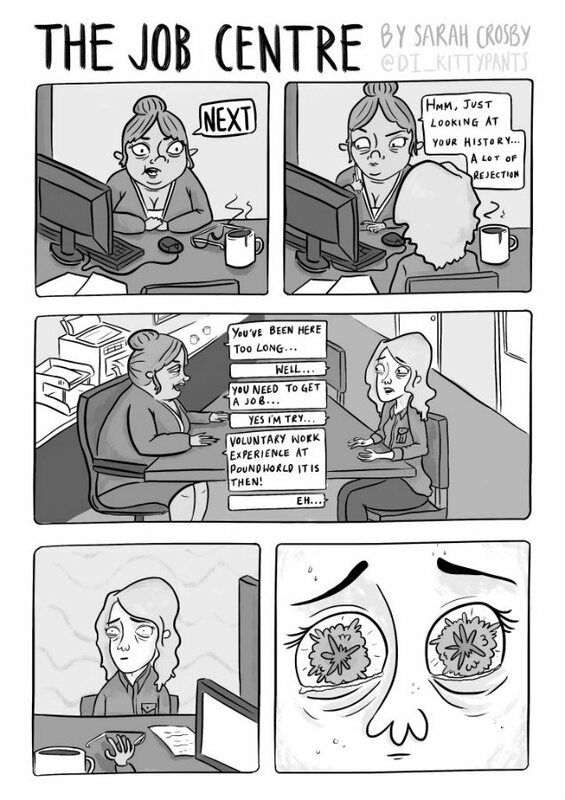 For more on Dirty Rotten Comics visit their site here. You can buy Dirty Rotten Comics #4 here priced just £4.00.